A wedding ring is a symbol to the rest of the world that the wearer is married. This custom is as least as old as 4800 years ago in Ancient Egypt, where the custom is believed to have originated. This civilization sprouted by the fertile Nile River. At first Egyptians used papyrus reeds, which grew abundantly by the riverside, to weave rings for their fingers. Eventually they transitioned to more permanent rings. The band itself is a symbol of never-ending love. The Egyptians originated the practice of wearing the ring on the third finger of the left hand—which is now referred to as ‘the ring finger’–because it was believed to be directly connected to the heart by a vein. It is no accident that the wedding band is circular as this was the Egyptian symbol of eternity. Ancient Egyptians did not think the circle symbolized fidelity, however. Many of them were polygamous. Other civilizations used the circle for the same purpose because it has no beginning and no end. In modern times, the unbroken circle of the band has come to mean an unbroken promise of commitment. Some ancient religions believed that a man, if unmarried, was only half a person. The full circle was meant to represent two halves joining together. At one time, husbands in the Middle East gave their brides puzzle rings. Removing the ring destroyed the puzzle and it could only be restored by knowing the specific combination of the intricate rings. This ensured loyalty on the part of the wife while the husband was away from her. Interestingly enough, today grooms in Italy and Greece are often given these same puzzle-style rings by their wives. The use of wedding bands was common practice in Ancient Rome and in many other ancient societies. The Romans took on the myth of the connection from the ring finger to the heart, which they called the “vena amoris,” or the “vein of love.” The Ancient Romans made their wedding bands from iron. Its durability was supposed to represent the strength and durability of a man’s feelings for his wife. Sometimes the husband presented his wife with a gold or silver band, symbolizing his trust in her with his worldly possessions. Gold became the standard choice for wedding rings, but in Renaissance Italy, silver wedding bands & rings became the customary choice for the betrothed. Silver has continued to be a choice for many brides and grooms today. Silver wedding bands & rings range in price from extremely affordable to fairly expensive, depending upon the simplicity or intricacy of the band and whether or not there are diamonds and gemstones. An unadorned sterling silver wedding band can be purchased in the $20 range. Depending upon how wide the band is and whether or not it is a comfort fit band, the ring will run in the neighborhood of $200 or so. This is still pretty affordable when compared to gold bands. Even the most narrow, plain-Jane gold band will set the purchaser back around $100. The prices go up from there. Silver wedding bands are inexpensive. Typically, even in matching wedding ring sets, the ring for the man will be wider than the ring intended for the woman. This is due to the fact that more commonly men’s fingers are wider than a woman’s. So even “matching rings” are not, in fact, identical. Many couples opt not to have matching rings. They choose, instead, to have the partners choose their own individual ring. Typically, a ladies wedding ring will be a 2mm, 3mm, or 4mm in width. However, there are ladies wedding bands, which are 5mm in size. A few are 6mm. Men’s wedding bands tend to start at about 5mm and run up through 10 millimeters or so. The width will impact the price of the band, regardless of the type of metal used. The men’s wedding band will cost more. The reason is because of its width. If a metal besides gold is desired, prices will vary. Platinum is one of the most expensive options on the market. Even a 2mm unadorned band in platinum will retail for close to $300. Platinum is silver in color and extremely durable. Many people cannot distinguish it from white gold or sterling silver. Jewelers typically do so with the naked eye. Titanium is a newly popular material for wedding bands. A band made of titanium alone is relatively inexpensive. However, it is often coupled with other precious metals, driving up the price. Wedding bands made from tungsten are all over the market. This is another inexpensive material. Like titanium, this metal is frequently united with other materials, to make unusual bands. Tungsten has a grey, gunmetal color to it. Many people prefer silver to titanium because it is grey and cannot be re-sized. Titanium is an extremely hard metal and tends to wear down the tools jewelers use to make rings and re-size them. Stainless steel is even being used in wedding bands now. Many people prefer sterling silver wedding bands & rings to stainless steel, because of the precious nature of silver. It is also because of silver’s undeniable color and shine. The classic, classic band is a safe bet. However, many brides and grooms are opting to choose more elaborate designs. Silver wedding bands & rings with diamonds, inlays, or intricate patterns are becoming more and more common. Everything from a sterling silver band encrusted with a complex pattern of marcasite to a band covered with diamonds and engraved with the names of the bride and groom can be had. Channel set diamonds on silver wedding bands are plentiful. There are even stainless steel bands dyed black and accented with gold plated patterns. The bride and groom can find bands as unique as they are. Before 1940, most men did not wear wedding bands. It was during the Second World War that men began to wear wedding rings. The long separation from his wife was somewhat eased with a physical reminder of her on his person at all times. The Korean War brought another increase in men bearing wedding bands. Today many men choose to wear wedding bands. Many brides-to-be insist upon their intendeds donning a ring at the ceremony and wearing it all the time. Many people regard a married man who does not wear a ring as suspect. Right or wrong, many assume his resistance to a wedding band is resistance to announcing his marital status. Buying the proper size ring is crucial when shopping for a wedding band. If the size is unknown, a trip to a local jewelry store can solve the dilemma. This is accomplished by slipping a series of metal bands around the finger to ascertain the size. There is no need for embarrassment or shame when asking to be sized if no purchase follows the request. Jewelry stores consider this a down payment on goodwill with a future customer. There are also numerous ring sizing tools online. Amazon offers one online. If no printer is available, a close measurement can be ascertained from wrapping a cloth measuring tape around the finger and comparing the measurement to the chart listed online. In the absence of a tape measure, a piece of paper can be wrapped around the finger and then measured. If the knuckle of the finger is slightly larger than the location where the ring would sit, the ring size should be adjusted up by a half size. 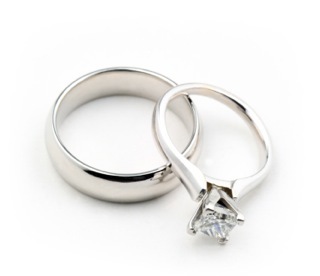 If silver wedding bands & rings are being purchased online, ensure there is a return guarantee. Most online jewelry stores offer this service to ensure customer trust. Many people would prefer to shop online rather than a brick and mortar store. Between the online ring sizing tools and the generous return policies of most stores, online ring shopping is without real risk. To ensure a proper fit, try on the ring at different times of day and weather. Humidity and time of the day can alter ring size due to swelling. Also, the ring should be tested for size at least a week prior to the ceremony to ensure it will fit at the critical moment. Anything associated with weddings costs more money. Be prepared to shop around to find the best price. Most people find that department stores often have terrific deals, and shopping online will save you quite a bit of money, as well. Many brick and mortar stores also have an online venue, as well. Many folks do not want the pressure of a salesperson, when making such an important decision. Online venues give them the freedom to decide, at their own pace, and in the comfort of their own home. Shopping online eliminates any possibility of a charming salesperson talking the buyer into a purchase they would not have bought otherwise. Silver wedding bands & rings can easily be found online in a variety of designs from the ornate to the simple. At one time, there were certain names that were synonymous with wedding bands and engagement rings. Zales, Kay’s, Helzberg, and Jared are all common household names of jewelers. However, these stores are also synonymous with steep prices. Today many brides and grooms are choosing to save money where possible and spend where it makes sense. By purchasing silver wedding bands & rings from online vendors and other more affordable outlets, additional money can be devoted to things, such as the reception and honeymoon.